That eventful day, I went home with a twenty-pound bag of red potatoes...determined to see for myself what baking would do to them. Eventually, the kitchen was filled with wonderful comforting, baked-potato aroma...and I was ready to be the next great potato critic. Before that day, I liked red potatoes and afterward...I loved them. Baked red potatoes have a wonderful flavor and a tender, moist texture that is never mealy. Left-over baked red potatoes are versatile and can be used in soups, salads, and added to other main dishes. Besides learning that they can be baked, I find it amazing that it took so long for modern cooks to stop peeling red potatoes! Not only does the peel add color and flavor, it also increases the food value. By leaving the skin on while cooking a potato, the vitamins and minerals will not leach out. In fact, almost twice as much of the vitamin C content is leached away when a potato is peeled and boiled than if was left unpeeled. Storage of our favorite tuber has often been unclear...potatoes should be stored in a cool, dark environment and NOT in the refrigerator. Storing them in a paper bag is better than plastic as it lets the potato breathe. Also, if they are exposed to light for a length of time, the skin will become greenish. That green skin is actually a chemical change and is not healthy to eat; cut away any green parts and discard. 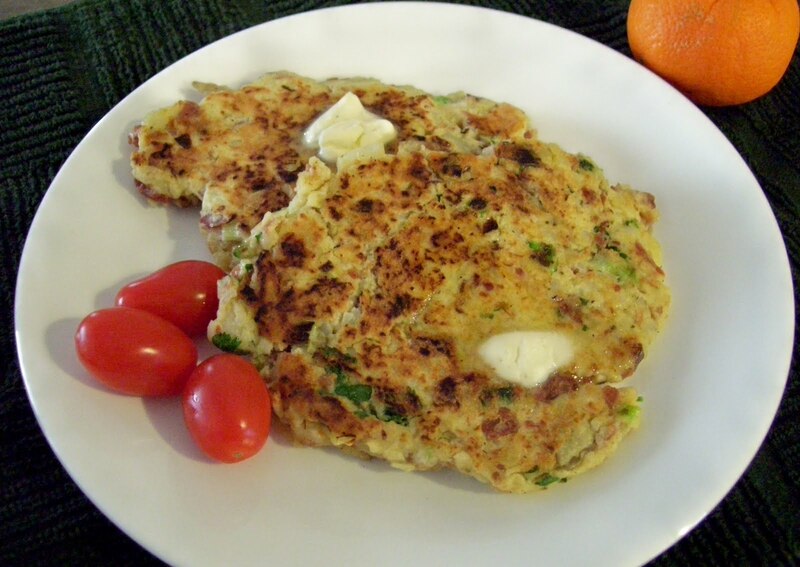 Today's recipe, Bacon Potato Patties, is so easy, even college students could make it in their dorm room if they had a microwave and a hot plate. This easy, tasty dish is great for breakfast, lunch or dinner and has been updated with the use of bacon bits to decrease the fat content. Cook potatoes in boiling water until tender. Drain. In a medium bowl, mash well. Add remaining food ingredients and mix well. Alt.method - microwave potatoes in *quilted 'tater' bag 5-6 min. on HIGH until tender. Remove from bag, and mash well. Add remaining food ingredients and mix well. *(See post #3 for potato bag picture and directions). Spray griddle and heat to med-high; drop spoonfuls of potato mixture to form four patties. Flatten patties with spatula and fry both sides until nicely browned. Remove, and place on serving plates. Dot with margarine. Serve immediately. *Note - the bacon bits have half the fat content of real bacon. Marian wrote: That does sound good, Diane. I recently had some red potatoes at Missouri S & T that had been "chunked" and baked in the oven with either rosemary or bay leaf (or something else) sprinkled on them. They may have been brushed with butter, too. They were really delicious.